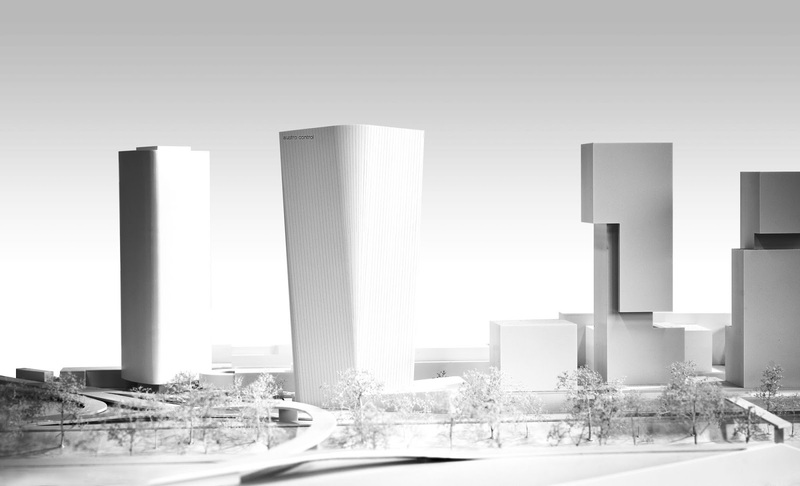 Winning proposal for a tower in Vienna. 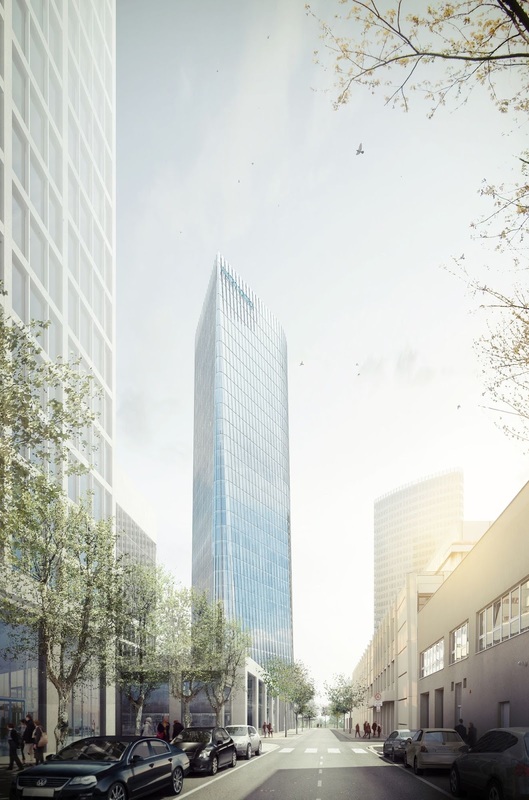 Our proposal for the new office Tower building in Vienna, Schnirchgasse 11, location Austro Control aims to strike a balance between a distinctive identity for the complex and an efficient operation, both in terms of flexibility of use and environmental performance. We have tried to reach a solution where expression and efficiency are mutually reinforcing. 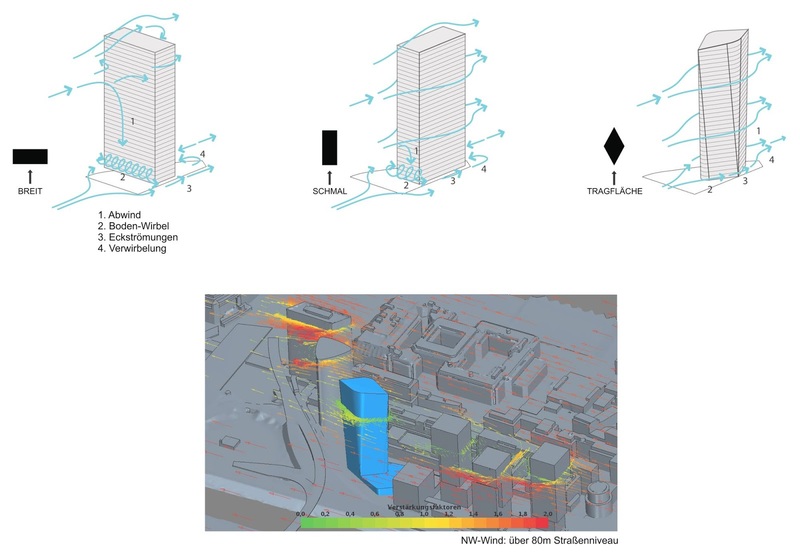 The tower volume was first determined by a combination between the provision of a floorplate with a column free 7 m bay surrounding a central core, and the application of shading regulations which constraints the position of the tower to the southernmost location on the site, to keep away from the University building. 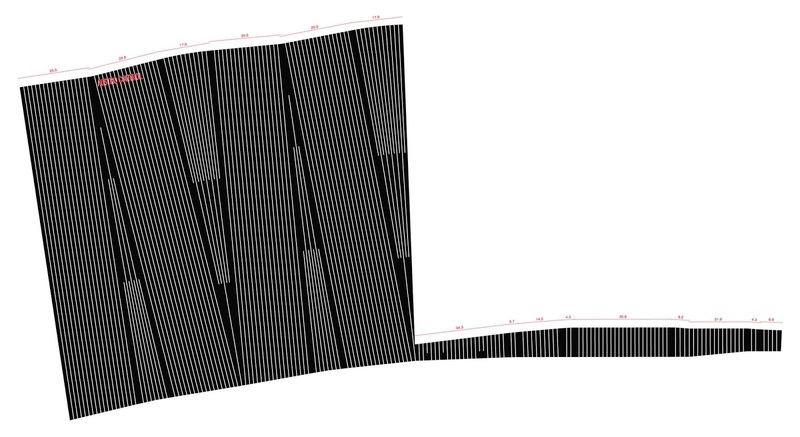 These two constraints produced a rhomboidal floorplate, derived from the geometry of the site and the shading conditions. The height of the tower of about 115 meters and 31 levels above ground is based on the guidelines of the city for the development of the area. The floor to floor height of 3,60 m is considered adequate for commercial as well as residential use. The form of the tower has been designed as an airfoil to minimize the impact of the wind on the structure, and to minimize the downdraft. 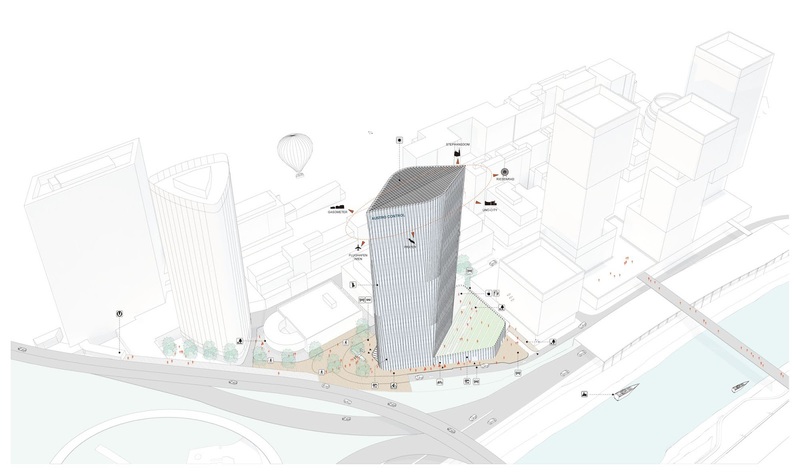 The basic plan of the tower adopts a diamond shape, which is oriented in direction NW-SE, to follow the prevailing wind directions in the area. Taking as a constraint the SE edge of the site, we have built through mirroring a footprint which contains 1028 m2 of gross area. 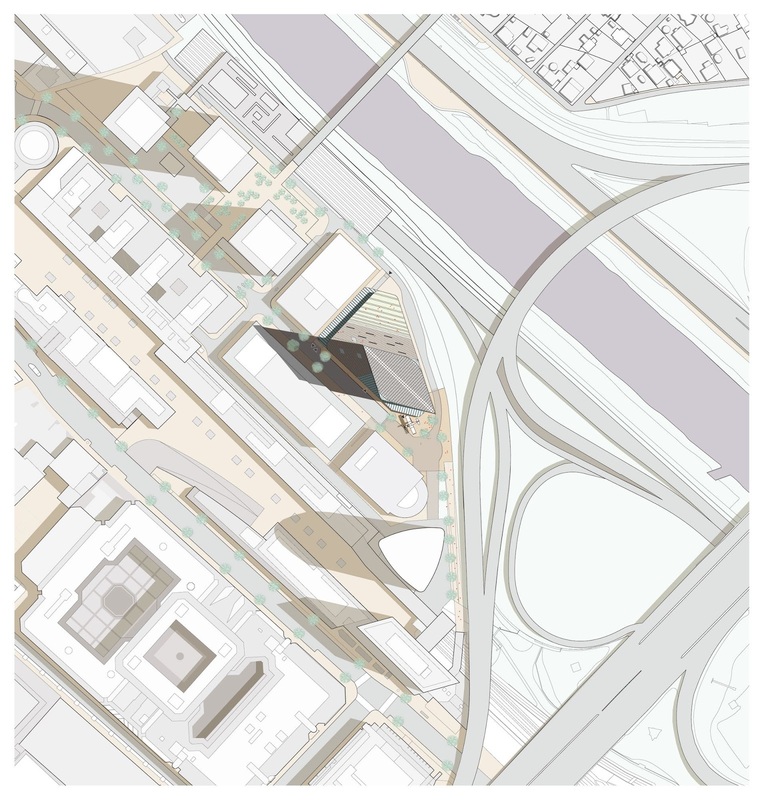 When mirroring that edge along an axis parallel to the Schnirchgasse, we have automatically obtained a triangular plaza on the southernmost tip of the site, which will act as entry plaza to the new tower. 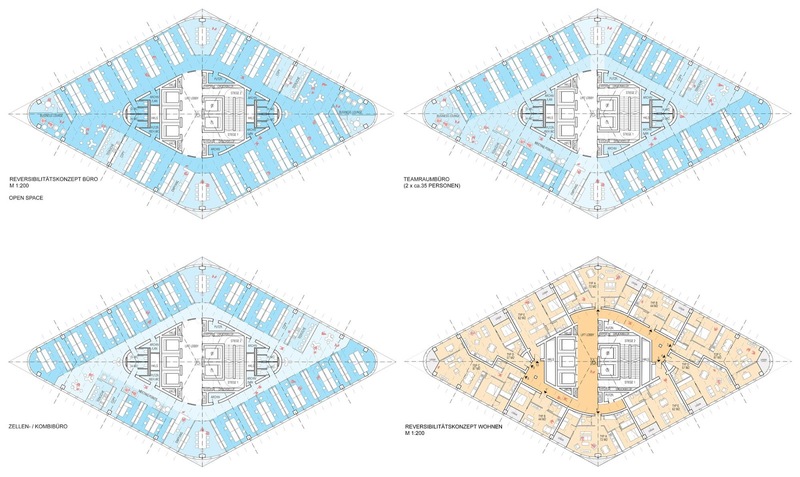 The rest of the site has been covered by a double height socle which contains the convention centre, the public parts of the program and some services to the building. Below grade, we have located 4 levels of carpark, storage and mechanical services. 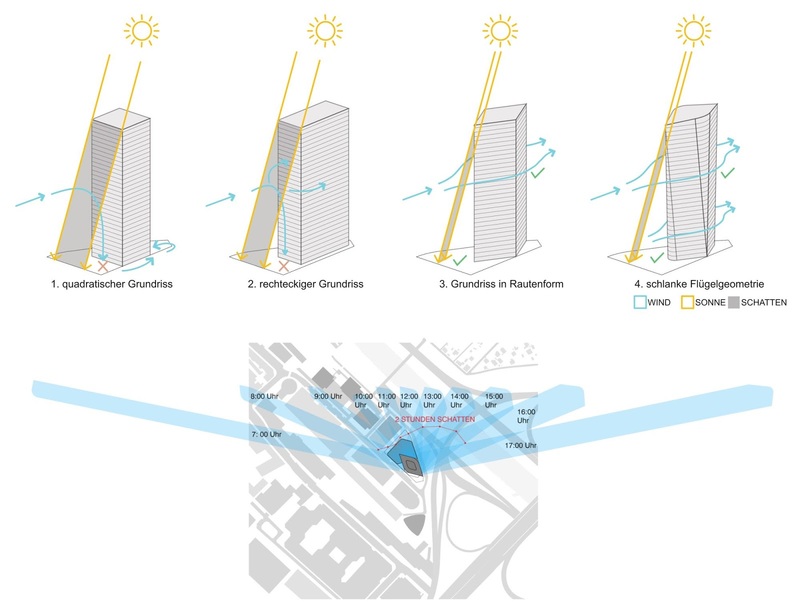 The airfoil shape in plan of the tall tower enables the tower to fit within the shading envelope and to minimize exposure to the wing (wind? )and downdraft. The airfoil adopts an aerodynamic shape, no dissimilar to those which we can find in the aerospace industry. 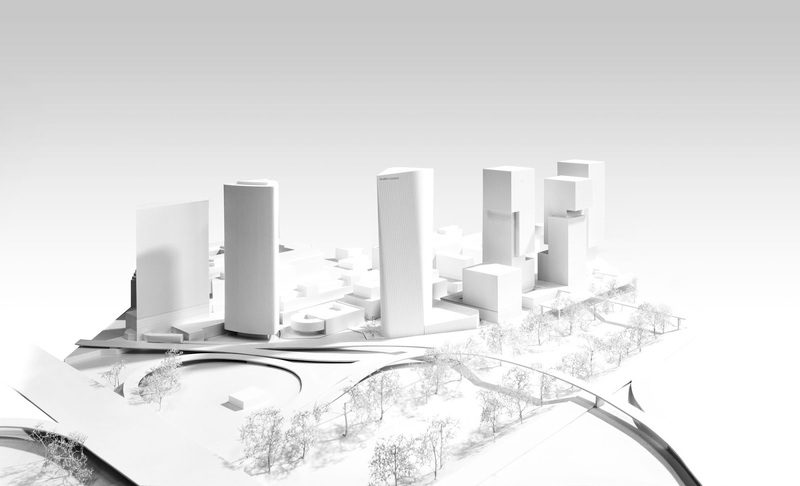 It also produces an elongation of the plan along the riverfront which optimizes the views toward the Prater of the east-facing side of the building. The sharp corners of the extruded parallelepiped have been rounded with conic sectors in order to produce a tapering effect in the form, and to destabilize it as an extrusion. 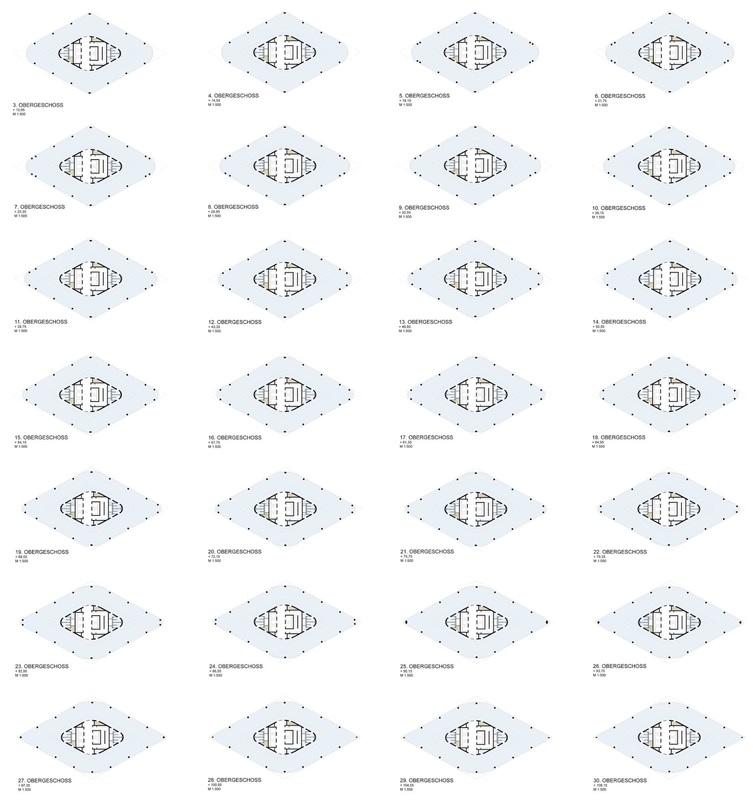 Simultaneously, these rounding of the corners of the form, which occur alternatively to introduce a diagonal direction to the envelopes, are reinforced by a sequence of tilted mullions, which contribute further to the effect of weightlessness and dynamism which we want the complex to acquire. The effect on the skyline from the Prater is akin to a tapering wing, a simple and elegant but unique skyline. This characteristic silhouette will also contribute to articulate the direction of the University Complex towers with the triangular shape of the ORBI tower. The building envelope has been designed in order to optimize its environmental performance. It is constructed with a triple glazed envelope, in which there is an external single layer which encloses a 300 mm air chamber containing variable louvers to protect the skin from solar radiation while allowing maximum transparency when possible. The inner layer of the envelope is built with standard double glazed, aluminum framed units. 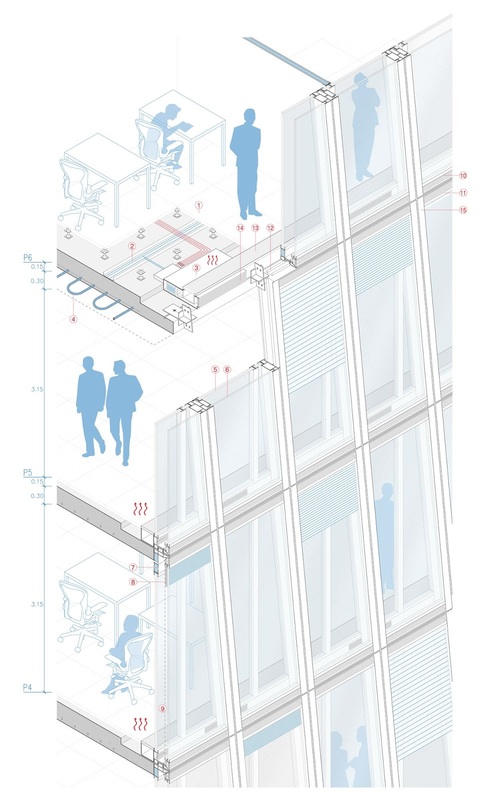 While the mullions of the inner, double glazed skin are running vertically on a 1,40m grid which will allow maximum flexibility to install interior partitions, the mullions of the second layer have been laid out in parallel to the sliced edges of the form. Both systems of mullions are therefore producing a diagrid with a very acute angle, which operates visually as a moire veil, aimed to further de-stabilize the gravitational affect of the structure. In terms of environmental performance, the envelope system will allow for natural ventilation of all spaces in the building. 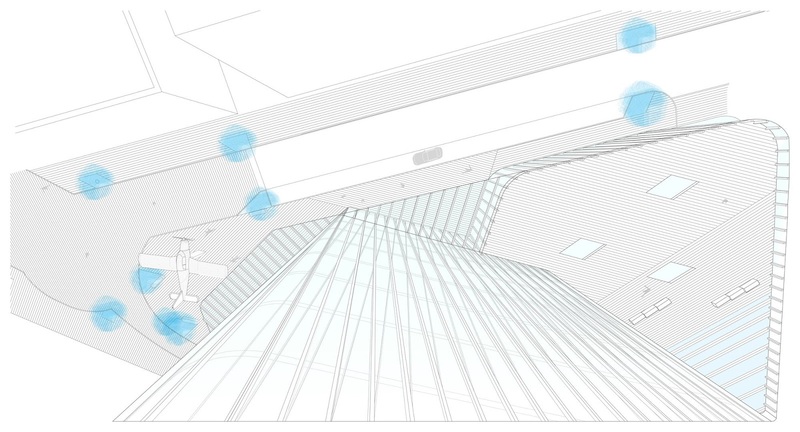 The external mullion system will regulate the ingress of air into the air chamber, from where a decentralized ventilation system will process the air and feed it into the functional spaces. 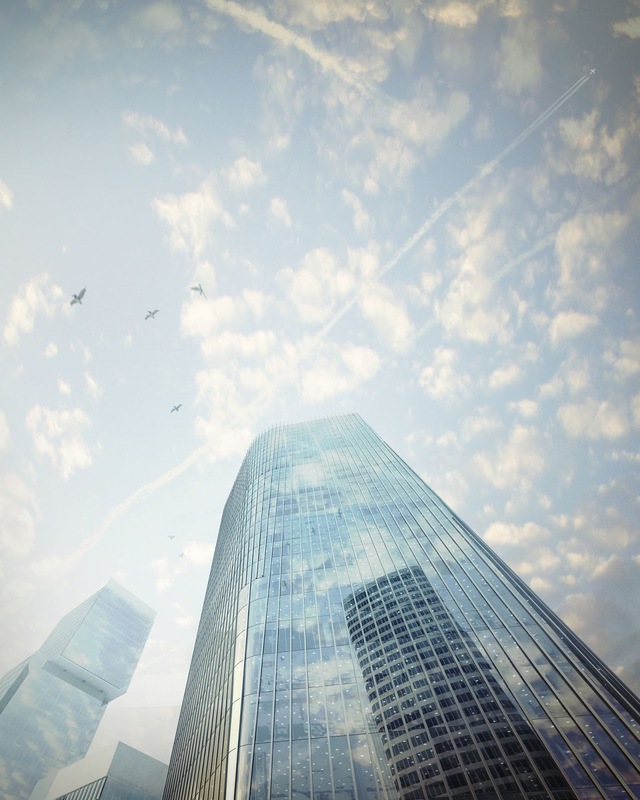 The air will be preheated or precooled as it is fed into the building from the façade perimeter, eliminating the need for air ducts, and allowing to maximize the height of the space. The exhaust air will be collected around the central core and extracted to the roof through several ventilation ducts. This will minimize the energy required for ventilating, heating and cooling the buildings. There will be no air-based heating and cooling system in the buildings. All temperature control will be provided by radiation. 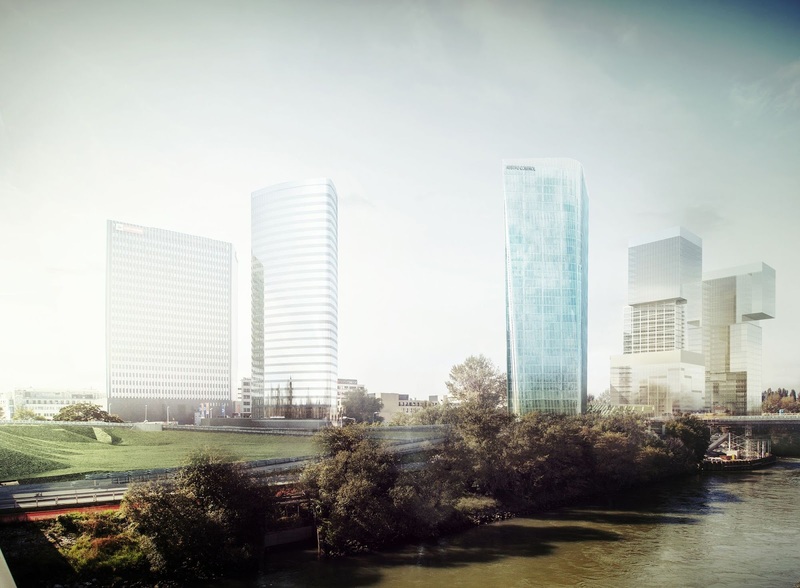 The buildings will have a concrete structure, which will contribute substantially to their environmental performance. Cooling will be provided by cold water coils embedded in the concrete slab, acting as radiators. Heating will be provided by the distributed ventilation units. 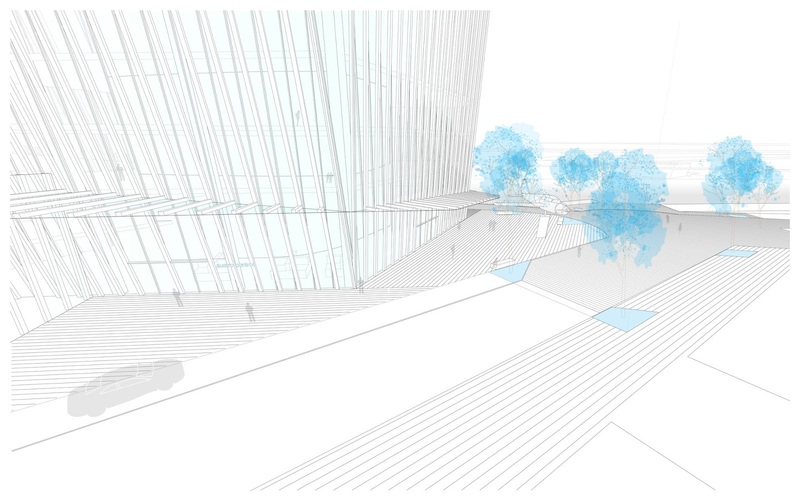 The public realm of the tower is conceived as a banded pavement which emerges from the geometry of the building. The banding of the pavement is designed to accentuate the strong shape of the tower and emphasize the convergences of routes which occur in the plot. The paving is materialised in a granite letterbox shaped blocks of mid grey colour. The lighting and the surface water drainage channels will also follow these lines of banding. 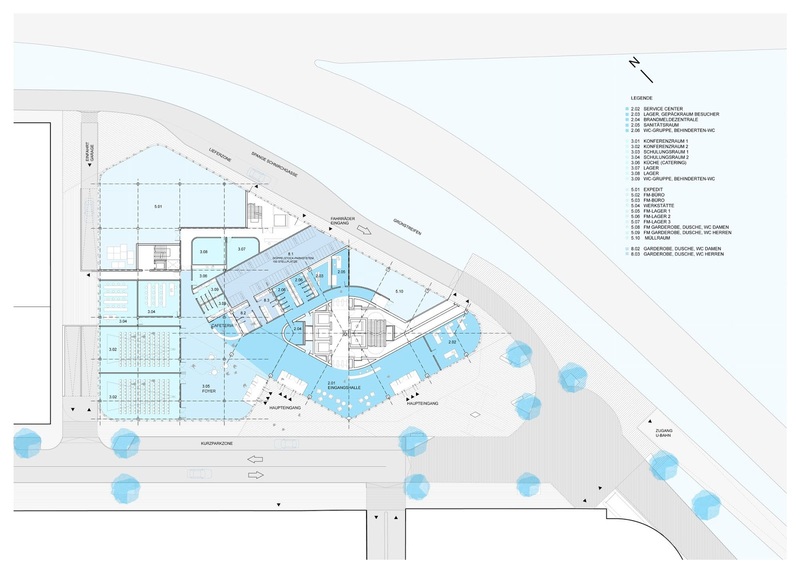 This banding starts in the tower and colonizes this new shared pedestrian space around it, generating a new pedestrian friendly space which connects to the neighbour buildings and the nearby underground station. A) In the South around the two main accesses to the complex. This space is dominated by an aeroplane sculputure. There are some seating opportunities facing the South around the 3 new trees (acer platanoides) which shade during the Summer and protect the users from A) the wind. B) On top of the sockle, the terrace is paved in a two tone banding banding: mid gray granite and grass with some vegetation. This space is created as a relax area with numerous benches looking to the Prater.